In any city in the country, your vehicle is likely to be seen anywhere from 20,000 times to 70,000 times per day. As seen in the recent film smash, Jon Favreau’s “Chef”, food trucks are becoming a popular destination in cities everywhere as they’ve gone from being somewhere to get cheap food to offering treats and items that a customer can’t get anywhere else. We live in a society that is always on the go. Whether it’s a young professional, a student, or a couple or family out on the weekend, food trucks are perfect for them. Effective custom vinyl graphics will ensure that your truck can be properly identified and make you stand out from your competition. 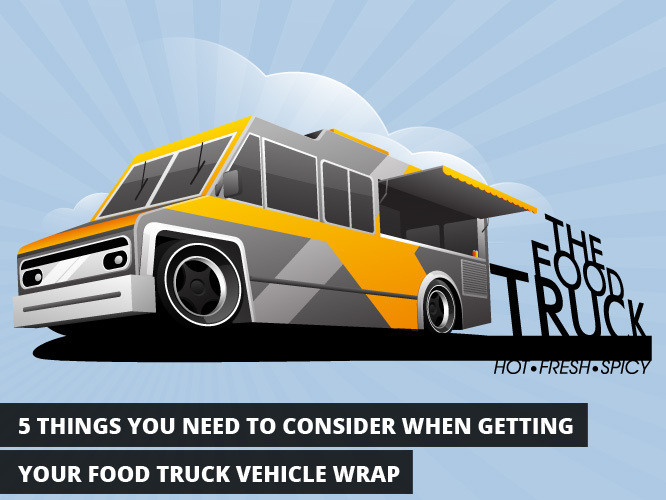 Here’s what you need to consider and what you need to know when going in to get your food truck vehicle wrap. Color is the first thing a customer will see. When we think of McDonalds, we think of red and yellow. When we think of Coke, we see red. When we think of Starbucks, we see green. Depending on what kind of food is being sold, know what color appeals to your demographic. While red may work for a truck specializing in meats, a bright green would work for a vegetarian or vegan-based truck. Go bold. Your wrap is large enough to not only advertise your business visually but to advertise a call to action for customers by either offering them a phone number or email to call, a Twitter handle to follow, or a Facebook page to like. Ensure that the wrap also contains the name of your business as well as some of the food you serve. You want to make sure that when someone sees your truck, they instantly know the name of your business, what you serve, and how to get in touch – just by a quick glance. In order to look professional, you’re going to need to work with professionals in areas where you don’t have the expertise to complete the task to your standard. If you want to get your vehicle professionally wrapped then know what you want to wrap it with. If you’re not 100% satisfied with your logo, take it to a professional and get it re-done. You want a logo that is going to grab peoples’ attentions and cause them to want to come over to your truck to see what you’re cooking. You may want your wrap to feature specific images that aren’t necessarily available in stock photos – perhaps of you, the kitchen inside, or a special menu item. If you’re going to put a unique photo on your wrap, ensure to hire a professional food photographer and a food stylist that know how to make what you look appealing. Ensure that these professionals know the photo will be blown up to a very large size. This is why something taken on an Android or an iPhone just isn’t going to cut it. It’s difficult enough trying to design one large billboard for your business to be featured on the side of your food truck – remember that there are four separate sides that need to be covered. Consider what you want featured on each side. You may want a menu on one side, food photos on the other side, your name in oversized letters, or your contact information. There are many possibilities and seemingly an infinite amount of possibilities when it comes to creativity. These five tips here will ensure that you’re prepared for when you need your food truck vehicle wrap. Think outside the box. Keep in mind that the more creative you are and the more that you can make your truck stand out, the more business you are likely to receive.